I wonder if the Azerbaijani government knows how much it owes to Betty Blair and Azerbaijan International in promoting their country's culture to the world. I should also not forget Marvin Rosen who, in addition to championing Hovhaness's piano music on Koch International, continues to play various pieces by Azerbaijanis on his classical music radio programmes in the USA. Having already reviewed two oil-company sponsored boxed sets from Azerbaijan International I took to this two-disc set like a duck to water. For a start the set is winningly designed with a card triple-fold case which opens out to reveal a booklet tucked into a pocket and two stem-mounted discs. There are criticisms but the first impressions are positive. The downside is that we are told nothing about the composers or the background to this music and the recordings. I can live with that in the face of some worthwhile and, in the case of Hajiyev, Rzayev and Garayev, brilliantly imaginative music. Incidentally you may have seen Garayev listed elsewhere as Kara Karayev on Melodiya, Olympia and Russian Disc. It is the same person - just a matter of a different transliteration from the Cyrillic. The Scriabin recordings are very closely miked. These are done with just attention to unhurried tempi. The Op. 15 work relates to the smiling melancholy of the early piano concerto (one of the most underestimated of works in the peripheral repertory). The two Rachmaninov Etudes-Tableaux seem to be from the same acoustic with the moody threat of Op. 33, No. 3 successfully put across though the audaciously set recording levels do occasionally skid towards distortion. It is unlikely that you are going to seek out this disc for Badalbeyli's Scriabin and Rachmaninov (though you are likely to enjoy the experience anyway). The draw is to be found in the Garayev, Rzayev, Hajiyev, Hajibeyov, Hasanov and Melikov pieces. 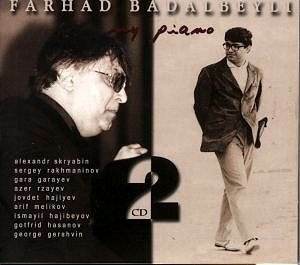 Hearing eleven of Garayev's set of 24 preludes in Badalbeyli's hands is specially valuable. His career has included studies in Moscow as well as the Azerbaijan State Academy. In Moscow his teachers included Victor Zak and Bella Davidovich. In the 1960s he was busy garnering prizes far and wide including the Vianna da Motta in Portugal (1965) and third prize in the Czech Smetana competition in 1967. As Eric Parkin has made a life's mission of the British piano literature so Badalbeyli has championed Azerbaijani concert music including works by Fikret Amirov, his uncle Afrasiyab Badalbeyli, T. Guliyev, V. Adigersalov, U. Hajibayov and, of course, Garayev. His long association assures us of insights into Garayev's world. Of the preludes: Nos. 2, 7, 11 and 18 are deliciously laid back and gently lyrical with a faint shading of dissonance - nostalgic, slightly veiled, not specially oriental - but not impressionistic in a Debussy/Griffes sense either. No. 11 suffers at the end from some tape wear that causes the signal to cycle slowly from channel to channel. No. 5 introduces a distinct sinuous sway into a meandering rhapsodic procession. No. 16 is mercurial like one of John Ireland's quicker pieces. Nos. 19-21 are brothers in style looking back to the romanticism of early Scriabin but with a Handelian trill and something of the gravitas and regretful shading of Finzi's Grand Fantasia. In No. 23 Garayev introduces a bluesy-cakewalk (had Garayev heard Kapustin on one of his USSR tours) with some unambiguous dissonance. I would have loved to have heard the complete set and would happily sacrifice the Scriabin and Rachmaninov if I could have had all twenty-four. Then come two Azeri violin sonatas with violinist Arif Manafli. Both instruments are tightly miked with some tendency to crowd the listener. The Garayev is in four movements. Here we have acid elegance, Shostakovichian tartness, a hoarse tune (tr. 2) which Heifetz would have loved (in fact Manafli's tone recalled that player), a third movement of half-antique preciosity and a finale that in its gravity links with his own piano Preludes 19-21. In its commanding violin writing this work suggests Mediterranean warmth. It ends quietly without hollow heroics. While Garayev largely abjures orientalisms Rzayev makes free use of the mugam style weaving it with threads of the sinister, the pastoral and the peremptorily jazzy. Listen to the irresistible scherzo episode in the centre of the andante (tr.23). Both Badalbeyli and Manafli make a superb job of this very fine work. The latter controls dynamic contrasts with great care and is able to turn the speed on a sixpence. Again this sunny intensity would have suited Heifetz or Kogan to a T.
Two solo piano pieces open the second disc. Hajiyev's Ballada is influenced by the oriental sway of the Mugam but otherwise is in stormy thrall to Rachmaninov. Arif Melikov's Fading Visions is rather like a cross between early Sorabji (the Persian dream-pieces), Alban Berg and Schoenberg. The Hasanov concerto is an Azerbaijani counterpart to Shostakovich's piano concerto No. 2. It is populist, flighty, glittering, sentimental (sometimes laid on with a trowel), Rachmaninovian and lightly dusted with mid-Eastern spices and Rimskian exotica. If you like the concertos or concertante pieces by Shostakovich, de Falla, Ferguson, Addinsell, Williamson (2) and Kabalevsky this will appeal. It is superbly carried off by Badalbeyli and Melik-Aslanov's orchestra. The Moscow-based recording of the Gershwin is eager and brash - qualities also well in keeping with the Hasanov. The Muscovites manage with extreme credit the bluesy middle movement and of course everything is closely recorded in that Melodiya way we know of old - must be a tradition handed down from engineer to engineer. I wonder to what extent Gershwin influenced people like Kapustin. The stony-bright sound of the piano works extremely well in this context. Badalbeyli has no difficulty with the idiom. He takes things slowly in the andante and zips along in the percussive aggression of the outer movements. It would be good to hear him in Nights in the Gardens of Spain or in Joseph Marx's Castelli Romana. Recording quality varies from the stuffy heat of the Scriabin to the throaty forward intensity of the Garayev and Rzayev to the tape-impaired cyclical damage of the end of the feral Prokofiev-like tumult of the Hajibeyov (only the last minute or so) to the natural sturdy clarity of the Hasanov. These recordings all appear to be in stereo. They were set down in various acoustics over what I guesstimate to be a period running mid-1970s to mid-1990s. This set will reward the adventurous listener and will have you returning to the Garayev preludes and sonata, to the Rzayev, to the Hajiyev and when you have tired of other populist concertos, to the Hasanov. A provocative collection of far from avant-garde piano music. Much of this music deserves a place in concert hall and competition. I urge any young pianist seeking attractive novelties for the international stage to track this disc down.